Built in 1971, the city of Saskatoon’s (Saskatchewan, Canada) wastewater treatment plant (WWTP) has undergone numerous improvements and expansions over the years to keep up with evolving regulatory requirements and to serve the growing population of Saskatoon. With the implementation of Bio-P removal, the facility saw an increase in phosphorus and other nutrients from the sludge handling process recirculating in the plant, resulting in greater nutrient loads on the main treatment process. Although the facility was effectively managing buildup through regular maintenance, struvite formation in the pipes and equipment was reducing flow, and capacity of sludge transfer lines was significantly reduced. The plant lost the ability to maintain heat in digesters as the heat recirculation pump suction line also was blocked. Unable to pump digested solids to the biosolids facility at a rate in which solids were being produced at the WWTP, the plant was forced to operate with more solids in the system than originally designed, causing lower-quality effluent. In addition, pipeline blockages had to be cleared using expensive flushing techniques with non-environmentally friendly chemical flocculants, and in some cases pipes and equipment had to be replaced. Lower operational and maintenance costs of the plant by mitigating the risk of struvite formation. Preventing accidental struvite formation in process piping and equipment to reduce maintenance costs and improve process performance was a major objective for the WWTP. Another objective was implementing a technology that not only reduced risk, but also created a marketable fertilizer product, creating value from what would otherwise be nuisance struvite. In order to solve operational challenges, the city of Saskatoon WWTP implemented Ostara’s nutrient management solution. The Pearl process removes phosphorus and nitrogen from wastewater streams, then converts the recovered nutrients into high-value fertilizer sold as Crystal Green. Saskatoon’s nutrient recovery facility consists of one Ostara Pearl 2000 reactor, alongside Waste Activated Sludge Stripping to Remove Internal Phosphorous (WASSTRIP) technology to increase phosphorus recovery upstream of the digester. Working together, Ostara’s technology suite can recover up to 70% of phosphorus for recovery, while significantly reducing accidental struvite formation. The WWTP also implemented Ostara’s PRISM trend analysis software to help the operations manager and operations staff monitoring the Ostara process. Trending features are used daily to help troubleshoot or monitor the efficiency of the Pearl production. PRISM provided another tool for operations staff to gain a better understanding of the Ostara process. 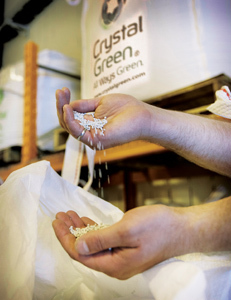 Production of Crystal Green is efficient and stable, with occasional challenges of fines production arising as a result of feed streams with high solids concentration. Ostara works closely with the city of Saskatoon, providing real-time operational support, particularly working in tandem to achieve optimal WASSTRIP performance in the winter months. Volatile fatty acids (VFA) addition and mixing times were experimented with during troubleshooting. The city was able to operate a sludge transfer line for three years before having to flush and clean the line, and digesters also benefited from lower nutrient loads in the tanks, with fewer foaming problems than in the past. Although there has been some struvite formation in the transfer lines, there have not been formations in the digester mixing/heating equipment. Reassured operators through 24/7 operational support. Operations and maintenance costs of the nutrient recovery facility are low, estimated at approximately $185,000 to $200,000 per year at 100% operational power. Costs to flush/replace pipes that have been impacted by struvite formation can cost between $250,000 and $1 million, respectively, so this process allows for significant cost savings. Furthermore, Ostara provides a guaranteed buyer for the phosphorus recovered (Crystal Green) in a long-term purchasing agreement that generates revenue for the WWTP through the sale of the fertilizer recovered. The total financial value of these benefits creates an economic opportunity for the city. There is strong evidence to support that phosphorus concentrations are significantly lower in the sludge streams when WASSTRIP and Pearl solutions are implemented. The city of Saskatoon implemented Ostara’s approach to cost-effectively mitigate an operational problem. The benefits are beginning to materialize. Improvements in anaerobic digestion and a large reduction in maintenance costs have been realized. The city believes this was the best course of action, as the technology offered benefits for the WWTP while generating an environmentally responsible fertilizer as a revenue stream. e entire project should pay for itself within 10 to 15 years.